This B&H Kit combines the Synology RackStation RS4017xs+ 16-Bay NAS Enclosure with sixteen Seagate 6TB IronWolf 7200 rpm SATA III 3.5" Internal NAS HDDs for a total storage capacity of 96TB. The Synology RackStation RS4017xs+ 16-Bay NAS Enclosure features four Gigabit Ethernet and two 10GbE ports as well as sixteen storage bays, so you can provide a custom storage solution for network-connected users. The sixteen bays support SATA-based 2.5" SSDs as well as 2.5" and 3.5" HDDs. 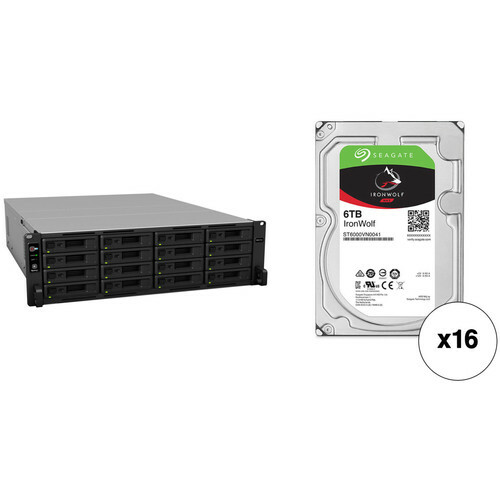 Once user-supplied drives are installed into the bays, you can configure them in a RAID 0, 1, 5, 6, 10, JBOD, or Basic mode to preserve data and increase the drives' read and write speeds. Aside from storage capabilities, the RS4017xs+ leverages a 2.1 GHz Intel Xeon D-1541 octa-core processor and 8GB of DDR4 ECC memory to quickly manage and deliver data. The RackStation RS4017xs+ comes with two expansion port as well as two USB 3.0 ports for attaching optional storage expansion units, thumb drives, and other devices. For future upgrades, the RS4017xs+ can hold up to 64GB of RAM and additional 10GbE network interfaces cards installed in its two PCIe 3.0 x8 slots. To cool all the internal components, three onboard 80mm fans spin at various speeds to help dissipate the internal heat. In addition, the NAS features a 3 RU rack-mountable design and runs on two redundant 800W power supplies. The RS4017xs+ is built as a reliable storage solution with fast performance at over 690,000 sequential read IOPS and 4900 MB/s sequential read throughputs. DDR4 ECC RDIMM and 10GbE connectivity provide data accuracy and performance for a mission-critical environment. The RS4017xs+ provides flexible storage scalability with optional RX1217 or RX1217RP expansion units. You can connect up to 2 expansion units to the RS4017xs+, allowing a business to start small and scale big. The RS4017xs+ comes with a high-availability feature that helps ensure seamless transition between clustered servers in the event of a server failure with minimal impact to applications. To maximize storage space, Hyper Backup is available for backing up data in multiple versions with block-level incremental backup and cross-version deduplication. Moreover, the RS4017xs+ includes Cloud Station suite, providing automatic cross-platform data synchronization with file version control. Box Dimensions (LxWxH) 34.65 x 24.5 x 12.0"